Before Keith Richards wore skull rings on each finger, many in ancient cultures were claiming the skull as a symbol of power. In the 1400’s, the well to do and religious figures began adorning themselves with anything that reminded them life wasn’t forever. “Memento mori” is their name and they were always skulls or skeletons. The Latin term translates to “remember you must die”, which isn’t not the most calming of ideas, but death was even more of a mystery then that it is now. Queen Victoria took this idea and started the trend of creating jewelry which rather than marking the promise of death, commemorated the memory of a loved one who had been lost (in her case, The King.) There wasn’t much love for skull ring until the 1960s, when rock star royalty began wearing them. Since then, Favorite Skull Rings have worked their way—albeit newly accented with diamonds or precious gems—onto the hands of the ladies who lunch and men who practice law! We saw an untapped need, and as usual, pounced on the opportunity, creating some of our Favorite Skull Rings. Do you have an idea for a skull ring that you can’t find?? Send it to us and we will show you what we can do for you. One of the biggest men’s jewelry trends of the year is the skull wedding or engagement ring! Symbolically representative of mortality, strength, and mysticism, the skull has long be revered by cultures around the world for varying reasons. Whether you like calavera skulls, biker style skulls or sugar skulls, you’ll find all types of jewelry for men in our collection of Favorite Skull Rings. This is a list of our Favorite Skull Rings we have created. Skulls aren’t easy to create and are even more difficult to incorporate into jewelry for obvious reasons, but we have forged ahead and created enough cool skull wedding and engagement rings that warranted a blog post! If you have an idea for a skull ring, send it over to us and we will show what we can do for you. Incorporate a little edge into your jewelry collection with these skull rings. Whether in high-polished silver, soft yellow gold, or studded with diamonds, these “spooky” pieces look a little elegant, a little dangerous — and just right for skull lovers who want to make them a part of the symbol of their love. Here are our picks from the skull rings we have designed.. This skull engagement ring has two skulls underneath the center stone and halo. It is surrounded by wisps of smoke and makes good use of the dead space around the skull. One of our Favorite Skull Rings, it isn’t too over the top and most people won’t even see the skulls. The head of the ring is very unique with how the halo was contructed…click on the link to see the top of this ring. 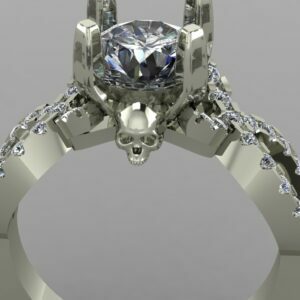 This V Halo Skull Engagement Ring is the top seller of our Favorite Skull Rings. It has 2 skulls facing outwards from the shoulder of the ring and is accented by almost 2/3 of a carat of diamonds. The only problem with Skull Rings is that many require a wide band or large center stone to have a ring that can accommodate a skull. When adding a skull to jewelry, you are taking something measured in inches and shrinking it down to something measured in millimeters. So you lose a lot of detail and the larger the skull is, the better Favorite Skull Rings will come out. 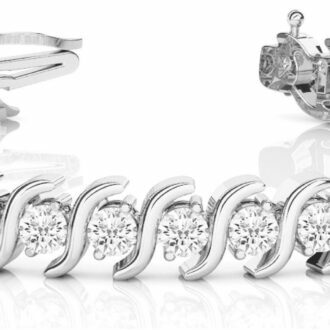 Favorite Skull Rings – If you want bling! This is a honker, but it easily made the list of our Favorite Skull Rings with the diamond encrusted skulls going around the ring. It also has two rows of milgrained black diamonds going around its edges. This isn’t for the lover of dainty rings, but it looks pretty cool. This is a personal favorite among the Favorite Skull Rings of Valeria Fine Jewelry. It is 8mm wide and has 6, 2.5mm black diamonds alternating with a skulls going around the ring. Although we prefer round stones for bezel setting, the square stones just seemed to work better. Looking at this infinity engagement ring from the top and you would probably never realize there are two skulls underneath the center stone! We love it when people get something unexpected…most people wouldn’t expect to find a stone in an elegant infinity ring like this. This skull ring was actually one of two guards created to accent an existing solitaire engagement ring. Each had a skull looking outward, a semi halo, and accents on the band. When put together, the solitaire looked like a skull halo engagement ring. You might find rings that look like our Our Favorite Skull Rings for less on Ebay, Etsy, or Amazon. However, rest assured they are made in Asia where quality is low on the list of priorities. Asian jewelry is notorious for being thin and cheaply made. And if your ring has stones in it, they will be the lowest quality possible. If you want one of our Favorite Skull Rings that will last, have it made in the USA! 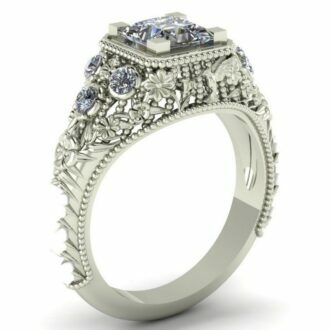 Click HERE to see more Favorite Skull Rings or contact us with your custom skull wedding ring idea. Any of our skull ring designs can be modified to fit your style. We can also create something totally new from the ground up. 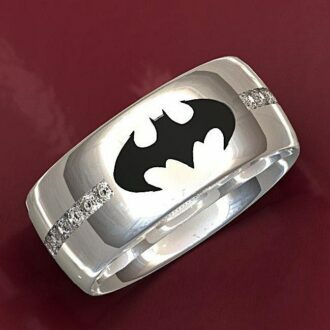 That is the beauty of custom rings…you can take something that already exists and tweak it to make it yours.